Preparing for a bar or bat mitzvah? 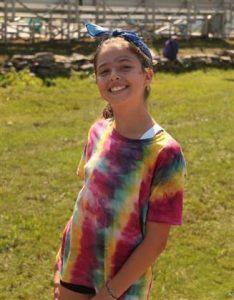 Consider a Mitzvah Project to support Perlman’s Annual Fund and help ensure that every camper has the opportunity to experience the life-changing magic of a summer at Perlman. What types of projects can I do? The options are endless! Your Mitzvah to the community is to give back, and you can do so by: Hosting a bake sale, volunteering at a local animal or homeless shelter, volunteering at your synagogue or school, partnering with a local restaurant as a fundraiser, collecting items for those less fortunate, hosting an event for your family and friends, and so much more! We simply ask that you make a donation of funds to contribute to the Perlman Camp Annual Fund. How will the community know about my project? Through e-blasts, newsletters, and social media, the Perlman team informs the community of current Mitzvah projects. To inform your family and friends, we often suggest sending out a personal e-blast, an evite, or creating a webpage. Where should I direct people to donate? All Mitzvah Mensches are featured below on the Perlman Camp Mitzvah Projects site page, and through this page, you can click to donate to individual projects. Each Mitzvah Mensch has an online e-cart item, as seen here. To share this easily with family and friends, we will provide you with a personalized bit.ly link. Is there a way to keep track of donations so we know who donated in my honor? Yes! Through our systems, we can track each donation specifically. On a weekly basis, we will provide parents with a detailed list of donors (names and amounts). Our organization will send an acknowledgement letter directly to the donor, as well. We’d love to feature you on our Mitzvah Project page! Please send a recent photo of yourself and a short blurb about your project to Mollie at mollie@perlmancamp.org. What should I expect as a Mitzvah Mensch? Your passion for camp and choice to give back to Perlman is so appreciated, and we love to share that with the community! You will receive a Mitzvah Mensch shirt that you can wear all summer. You will also get to add your leaf to the Mitzvah Tree, and be recognized for your wonderful accomplishment in a ceremony in front of your fellow camp friends and family on Visiting Day! Contact Mollie to learn more. She will answer any questions you have, and connect you with the Parent Committee for additional support. Micah and Daphna will become a bar and bat mitzvah in September 2019. They immediately knew that they wanted to do a project to support their home away from home, Perlman. Summer 2019 will mark their 9th year at camp. 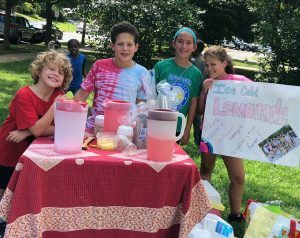 As their joint mitzvah project, they will host numerous bake sales and lemonade stands to benefit the Perlman Scholarship fund. Their goal is to raise the equivalent of at least one week of camp. Support Micah and Daphna’s Mitzvah Project here. 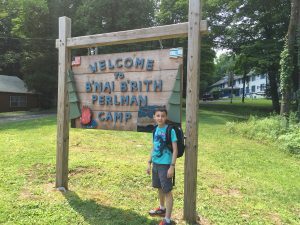 Jacob has spent the past four summers at Perlman and thinks it is a great place for kids to experience sleep-away camp in a fun, supportive environment and to learn more about their Jewish identity. He considers Perlman his home away from home – a place where he has made lasting friendships and has had the opportunity to try new activities like rock climbing and canoe fishing. 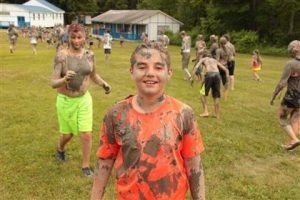 Jacob wants Perlman to continue to be a special place that kids can enjoy for years to come, so he is helping to fundraise for capital projects and facility updates that will help improve the camp’s infrastructure and have a lasting impact. Support Jacob’s Mitzvah Project here. Join Jacob Fisher’s mitzvah project, and donate your Kippahs to Camp! For a donation of $18, your kippot can become a part of Perlman’s summer forever. Donate kippahs from any simcha you and your family would like to share — your binah mitzvot, wedding, or bris. Jacob can’t wait to make Perlman’s Shabbats a colorful collage of everyone’s history to share! You can bring your kippot to the camp bus stop or to any other Perlman event — we even accept them through snail mail! Your kippot will be used by all of our campers for Friday night and Saturday morning services for years to come, and we will integrate them into our Shabbat Family learning! Jacob celebrated his Bar Mitzvah at camp in Summer 2018. Support Jacob’s Mitzvah Project here. I chose to have my bat mitzvah at camp because camp is a very special place to me. From the second the bus returns me to Maryland at the end of every summer, I start counting down when I can go ‘home’ again. Summer 2018 will be my 6th summer at camp as I started at 7 years old right after first grade. Ask me about how I started at camp- (it’s a funny story!). But you might wonder why I LOVE camp so much? Let me tell you. Reason 2: I feel very connected to the Jewish community- Shabbat is super special at camp. 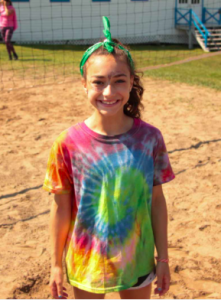 Reason 3: Perlman is a special place to me – I try new things, be myself, and really really let my hair down. Lily’s Mitzvah project will be a series of restaurant reunions for the Perlman community to attend. There they can gather, share camp stories and moments, and give back all at the same time! Support Lily’s Mitzvah project here. As soon as Max began planning his Mitzvah Project with his family, he immediately thought of Perlman. Max considers Perlman his home away from home. Max applied for and was granted a $500 scholarship by his synagogue’s Sisterhood, and chose to give back by donating that money to Perlman Scholarship. Max has made incredible friends at Perlman and the safe and secure feeling from camp has helped him to learn so much about himself, as well as strengthened his sense of belonging in the Jewish community. He cannot imagine not being able to go to camp, and he wants to make sure that all children have the opportunity to do so. Max is hoping that others will join him in his efforts to ensure every child has the opportunity to go to camp. 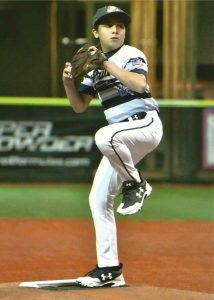 Support Max’s Mitzvah Project here. Tess celebrated her Bat Mitzvah in 2017, and after receiving her gifts, chose to donate a portion to Perlman’s Scholarship Fund. She is so grateful for the help she has received to go to camp, and she wanted to give back. Read Tess’ story and watch the video here! Join Tess in giving back and support her Mitzvah project here. 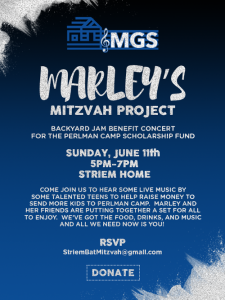 Marley hosted a Backyard Jam benefit by inviting a bunch of friends and family to come play and rock out to live music with her. She sent out invitations (pictured) to the community as they celebrated with her, raising over $4,000 for Scholarship. To learn more, check out her website here. Saul hosted a bake sale in his hometown as his Mitzvah project. He had a great time involving the local community and sharing his goodies! 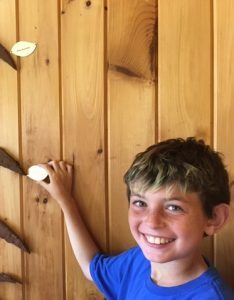 Saul (pictured) enjoyed adding his name leaf to the Mitzvah tree this past summer.